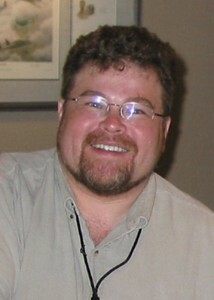 Tom Peters has served as a technical illustrator for a NASA contractor, a freelance illustrator, and a staff artist for multiple computer software companies. He is accomplished as both a 3D modeler, digital painter, and graphic artist. As a freelance illustrator, Tom has provided cover paintings for both volumes of Sharon Lee and Steve Miller’s Liaden Universe Companion collections, as well as two of their chapbooks. He has also worked with SF author Allen Steele on the visual and functional design of the spacecraft in Steele’s novel Spindrift. Tom now resides in the far-west suburbs of Chicago with his wife Diane and four art-directing cats. He works as a freelance artist, and as an instructor, teaching the fundamentals of Adobe Photoshop, Illustrator, and digital graphics production. Thomas Peters’ contribution to Starship Century: Illustration, The EASS Galileo, capable of near-light speed travel, as described in Allen Steele’s novel Spindrift. Are you or your group available to consider freelance contract for illustration material development for a mature space launch start up. We’re not contracting now, thanks.